Caprese Pasta Salad Recipe - The Flavours of Capri in a dish! 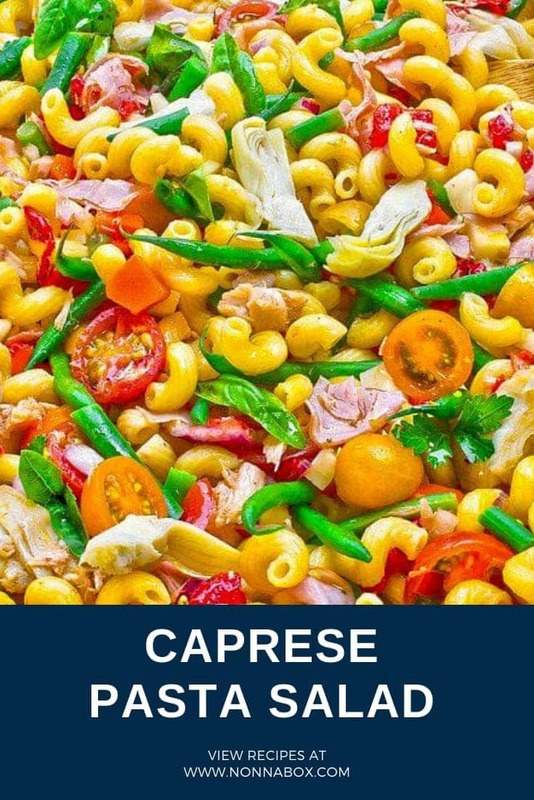 Caprese Pasta Salad Recipe – The Flavours of Capri in a dish! Caprese Salad is probably the most famous export from the amazing Capri island off of Napoli, but I wanted to make a summer pasta salad instead that had the same main ingredients. Perfect for a summer picnic or barbecue, Caprese Pasta Salad recipe is both colorful and flavorful. It’s best when served at room temperature, so you don’t have to worry about keeping it cold. This is also an excellent make-ahead dish, as leaving it in the fridge will allow the flavors to more fully meld. Although many of the ingredients in this recipe are canned, use fresh green beans for the best texture and flavor. Frozen green beans will work in a pinch, but canned will be too soggy. This recipe is all about freshness, flavor combinations, and vivid colors. I used ingredients that were imported from Italy: roasted peppers, marinated artichoke hearts, ham, Italian tuna, and the very best extra-virgin olive oil. Bring a large pot of generously salted water to a boil, add the pasta, and cook for 2 minutes less than the cooking time on the package. Drain the pasta, coat it with 2 tablespoons of olive oil, toss, cover with plastic wrap, and set aside to let cool. In a medium bowl, combine all the ingredients for the vinaigrette and whisk together. Adjust the salt if necessary and set aside. In a very large bowl, mix the bell peppers, cherry tomatoes, provolone, artichoke hearts, ham, green beans, and carrots. Add the vinaigrette, cover with plastic wrap, and let marinate for 10 minutes in the refrigerator. Before serving, remove from the refrigerator for 1 hour to bring to room temperature. Toss all of the ingredients together and serve. The island cuisine uses what is fresh and grown or caught in the area—tomatoes, fresh fish, fresh herbs and olive oil are staples of most Caprese recipes. This is a great dish to make for the summer, because it only takes a few minutes and it can be transported to the beach or any of your summer parties, and everyone will love it! Serve it fresh accompanied with homemade garlic bread. Pasta salads are so much fun! It’s my favorite summer dish, so yummy and easy to make. I like to be creative as well and play with different flavors. Definitely gonna try this one ASAP! That’s so true Alessandra! 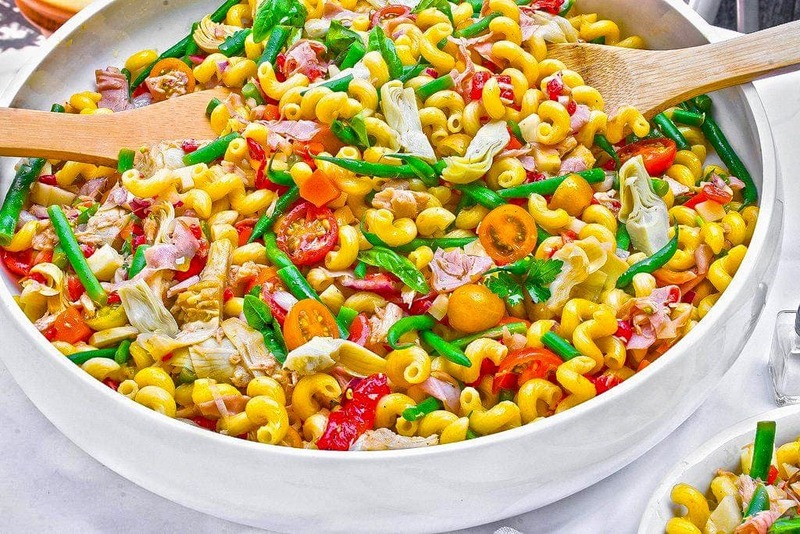 What’s your favorite pasta salad?